This was to be no ordinary Monday. I stood in the Green Point MacDonalds car park, midway through an uncharacteristically dreary Summer morning, waiting for him to arrive. As I monched my way through a somewhat unsatisfying McD’s burger (yes, for breakfast, don’t judge me), I wondered what was in store for me that day. My point of contact, Michele, had left out some of the details of my future, like, you know, where I would be for the next 8 hours. She was happy to elaborate, but I rather liked it that way, makes the adventure seem all the more exciting! I was just licking the mayo off my fingers when Josh appeared. With his shaggy locks and sneakers, he was the perfect driver for the VW kombi that was to be our transport for the day. Her name? Veronica! 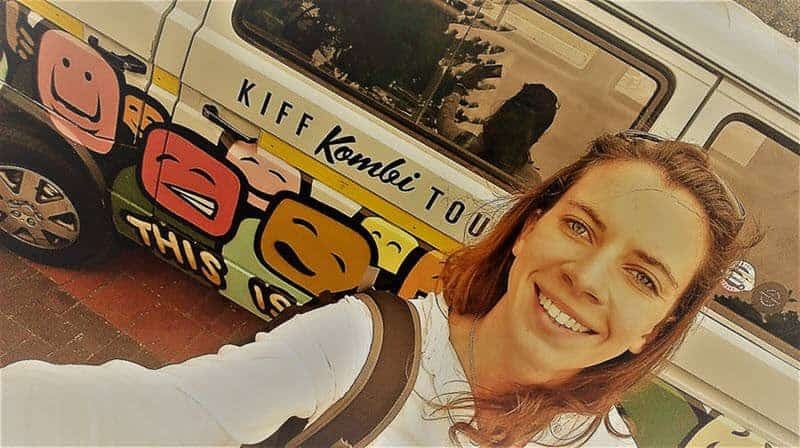 Her and her partner Vaughn make up the fleet that is Kiff Kombi Tours – on time, full of character and useful facts about Cape Town, what more could you want from a tour company? We picked up a couple from the UK at their accommodation and then we were off! As it turns out, we were to spend the day wine and beer tasting with the piece de resistance being an authentic South African braai in the Winelands (complete with dog, fireside stories and boerie rolls). Our first stop was Stellenbrau Brewery. It’s hard to believe that I’ve never learnt how to make beer, being a Cape Town based blogger writing right in the middle of the craft beer upsurgence, but there it is. So I was really pleased to have a tour of this microbrewery and learn the process. They seem to have perfected the process here and use local ingredients. 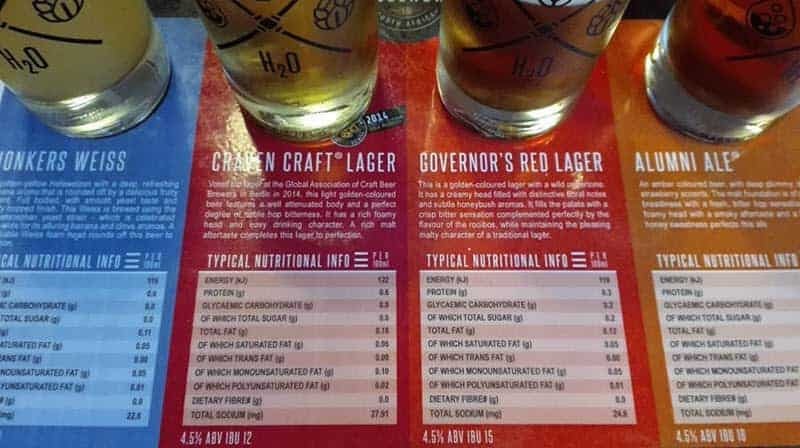 Also, have a look at the pic below, two of their beers have zero carbs or sugar! The tour is R70 and having a tasting after is well worth it, all their beers are super tasty. They only have four beers available and apparently no current plans to grow the range. But they really don’t need to; they have a beer suitable for every occasion and taste. 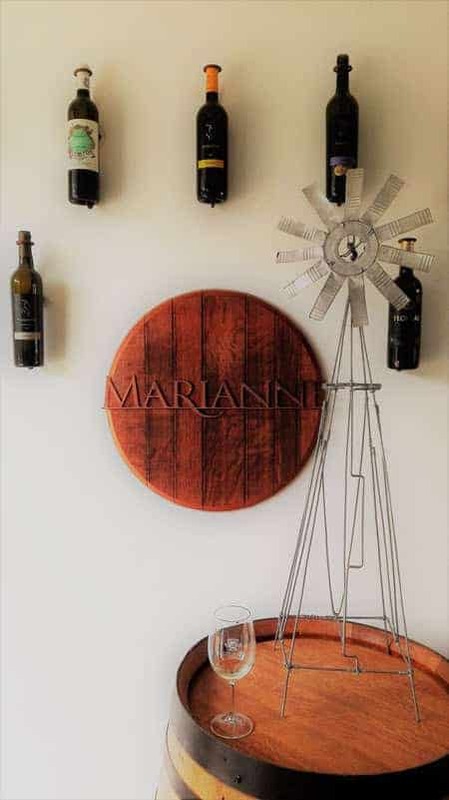 Next stop was Marianne Wine Estate for a biltong and wine pairing. I have to say that I enjoyed every one of the wines we tasted, especially the Merlot. 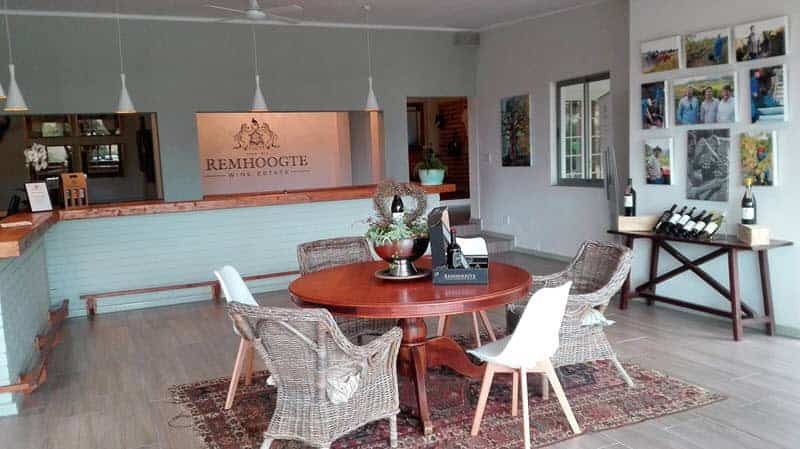 Each biltong was perfectly paired with three of their red wines, after tasting two of their whites. I’m not a big sauvignon blanc drinker but I could definitely get stuck in to a bottle from this estate. And much of the beauty of their wines is that they really are estate wines, everything from growing to bottling happens on the farm. This specific tasting costs R75 per person. The stylish interior with fireplace is great in the Winter, and the balcony affords beautiful views in the Summer. Lastly we found ourselves at Zebonkey, so named because it is the product of efforts by the dynamic couple Jan and Mignonne. 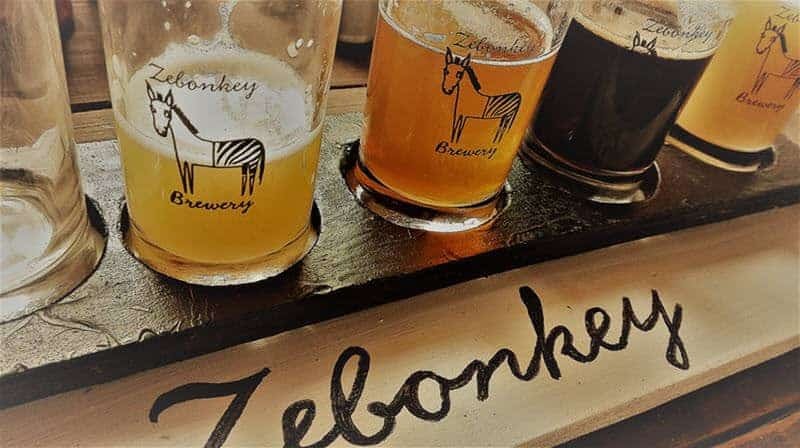 Mignonne manages everything behind the scenes (the South African Zebra) and her ‘imported’ husband Jan brings his German influence to the brewing process (the Donkey). I really enjoyed their Radler, it is perfect for these Summer days. And if you are looking for beer tasting that is out of the ordinary and gives you some peculiar yet intriguing flavours then this is the place. NITGB had organised with Jan that we have a braai there, so we threw a few chops and some boerie on the barbie, and had ourselves a lank kiff late afternoon. Jan is full of stories, and Josh is full of Cape Town trivia. Good company, good beer and good food. Perfect! Not In The Guidebooks, who can be accessed via their website www.notintheguidebooks.com, are dedicated to providing their clients with unique and authentic tours and travel experiences. It’s a very user-friendly process – just go on to their website and pick your area/city and the type of experience you are looking for on the dropdown menu and they will provide you with a list of search options. The packages seem endless, from a food art and culture experience in Woodstock, to Winelands cycle tours. Booking online is super simple – if there are set dates then pick which suits you. If there is an ‘enquire’ button then the local guides are happy to try and fit in with your schedule. They are currently operating in specific areas of South Africa, Scotland, Sri Lanka and Australia with plans to expand. I really had a positive experience with NITG, especially with my point of contact, Michele Harvey. She was great with communication via email and text. During our day out the weather turned and my fellow adventurers suddenly realised that they would not be able to join the bike tour they had planned for the next day. Before they could finish the thought process, Michele was on the phone with a new plan tailor-made for them and all the details. They were rather chuffed and I was impressed with the foresight and initiative from NITGB. I really had a positive experience with NITGB. They are efficient and their local guides and hosts are wonderful. The day was fun, insightful, chilled and well organised, everything I could want from them. If you are looking for an alternative and genuine experience, these are your guys. Check out article on ‘tips for cheap flights‘.